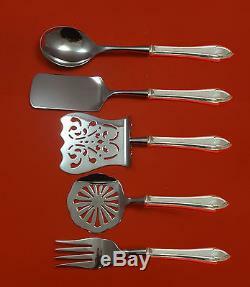 QUEEN ELIZABETH BY DOMINICK & HAFF STERLING BRUNCH SERVING SET 5-PC CUSTOM MADE. QUEEN ELIZABETH BY DOMINICK & HAFF. S terling silver hollow handle with stainless implement BRUNCH SERVING SET 5-PIECE CUSTOM MADE WHICH INCLUDES. 1 BUFFET FORK, 9" - for serving Ham or Carved Meat 1 LASAGNA SERVER, 11 1/2" - for serving Strata or Coffee Cake 1 CASSEROLE SPOON, 11" - for serving scalloped potatoes, scrambled eggs, & casseroles 1 EGG/TOMATO SERVER, 8 1/2" - perfect for serving Eggs Benedict 1 HOODED ASPARAGUS SERVER, 9 1/4. In the pattern QUEEN ELIZABETH BY DOMINICK & HAFF. It is NOT monogrammed and is in excellent condition. What is a "Custom Made" piece? Custom made pieces are made from an original piece in your pattern that are not otherwise available or difficult to find on the market, especially in discontinued patterns. Hollow handle items are made from an original handle in your pattern with a new stainless or silverplated implement. Then the piece is hand-finished by a highly skilled silversmith in the USA. CUSTOM MADE ITEMS What is a Custom Made piece? Hollow handle items are made from an original handle in your pattern with a new stainless implement. INTERNATIONAL ORDERS: It is our pleasure to work daily with clients around the globe. We accept international orders from over 70 countries worldwide. These charges are the customer's responsibility. The item "QUEEN ELIZABETH BY DOMINICK & HAFF STERLING BRUNCH SERVING SET 5-PC CUSTOM MADE" is in sale since Tuesday, April 28, 2015. This item is in the category "Antiques\Silver\Sterling Silver (. The seller is "antiquecupboard" and is located in Waukesha, Wisconsin. This item can be shipped worldwide.